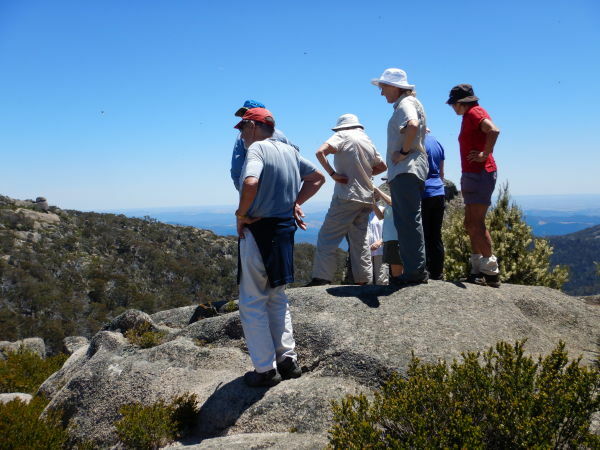 You Are Here: Home » News and Photographs » Walks » Mount Buffalo : Saturday, 1st December; Sunday 2nd December. 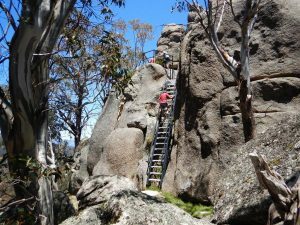 Mount Buffalo : Saturday, 1st December; Sunday 2nd December. In perfect weather, three separate club groups explored the Mount Buffalo Plateau last weekend. It was also perfect timing, as after recent rain, the wildflowers were abundant, with swathes of pink bells (Tetratheca), pea and daisy bushes providing colourful displays. The largest party (all 17 of them) walked the 10kms from the Reservoir to the Og, Gog and Magog features, and then to Eagle Point. Another crew completed a longer trip in the same area. At the same time, a small, but intrepid, group of walkers embarked on an overnight expedition to Rocky Creek Campground, and Mollison’s Gallery. Leaving packs behind at the campground for the steep climb up to Mollison’s Gallery, the views south over Lake Buffalo, and across to distant plains beyond Glenrowan, were rewarding for a tiring 14km day. There’s nothing like the peace and quiet of bush camping – except for the roar of the wild wind in the tree tops as we tucked into our tents for the night. However, in the small hours of the morning this became the quiet patter of rain drops, which appeared to be passing, until a thunderstorm struck at breakfast time, setting the campers up for a downpour, a wet pack-up and a wet walk back to their cars. In the upper Middle Creek area, high up on an isolated hilltop, are perched several carefully built stone cairns. Are they Aboriginal, Chinese, or a hoax? Regardless, they have clearly been there over generations of time, and the walk leaders, Geoff and Adrian, will guide you to the location. Wear long sleeves, but not good clothing, as the shrubbery is very thick on the steep, but quite short, climb. A good level of dexterity is required initially, but otherwise this is not a difficult walk. BYO lunch, which will be at Geoff’s bush block in Greta South. Afterwards we will have an exploratory, but easy, walk in the local area. When booking, please indicate whether you have a 4WD vehicle available. An easy 8km loop walk on bush tracks.